GM Says It Earned $4.7 Billion Last Year : The Two-Way It's the company's first annual profit since 2004 and looks to be another sign that it has emerged from bankruptcy a leaner company. Saying that it had revenue of $135.6 billion, General Motors Co. just announced that it earned $4.7 billion in 2010. As the Detroit Free Press reminds us, "the annual profit, GM's first since 2004, comes in the year after it emerged from Chapter 11 bankruptcy under government ownership." The newspaper adds, though, that "GM fell short of analysts' expectations of a $5.3 billion net profit, as compiled by Thomson One Analytics." 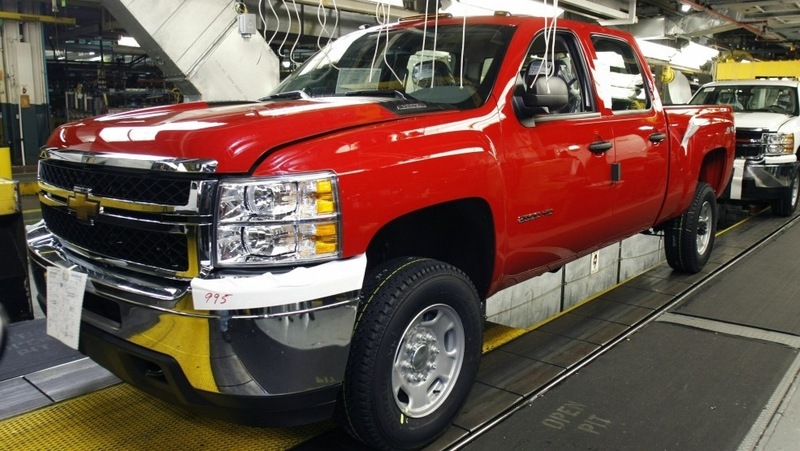 A Chevy Silverado Coupe Cab HD truck on the assembly line in Flint, Mich., last month. The Detroit News writes that the profit news is "further evidence the automaker's quick 40-day run through bankruptcy has produced a smaller, more streamlined company capable of earning big profits." According to the Free Press, "for taxpayers to break even when the government sells the rest of its [ownership] stake, GM's stock price needs to rise to about $53 per share. After approaching $39 in January, GM's stock closed Wednesday at $34.59, down 3.3 percent." At the height of the bailout, the federal government owned about 60 percent of GM's shares. It now owns about one-third.